End of May - early June, bagworms primarily on evergreens, pines, cedars and junipers. They can also be seen on willows, sycamore, locust, redbud, elm and burning bush. 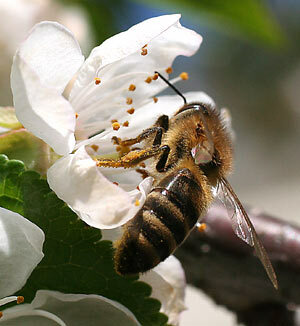 Most insects are not harmful to healthy lawns for example the honey bee. In fact, they are especially beneficial not only for pollination of our farm crops and orchards, but also for our home gardens. Honey bees have really been hit hard over the last decade or so and we feel they deserve our support. However, there are some lawn insects that when they reach a critical number can cause extensive damage even to the healthiest lawns. One of those insects is the white grub, which lives in the soil for about 10 months. During part of that time it feeds on the roots of your lawn and as it does so, the turfgrass plant eventually dies off complete, root and all. This damage will require extensive lawn renovation to bring it back. The white grub is actually the larval stage of the Japanese Beetle that is quite common around here. 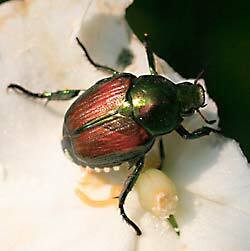 The adult beetle will lay hundreds and hundreds of tiny eggs into the soil. These eggs soon hatch and turn into grub that feeds on your lawn. During the winter months, the grub burrows deep into the soil and goes dormant for the winter. Then when temperatures begin to rise in the spring, the grub moves closer to the root zone and once again begins to feed on the roots, just before they pupate and emerge as an adult beetle. Most of the damage caused by the grub occurs in late August and early September. Irregular patches of turf dying in late summer is a good sign of grub infestations. In fact, a good test is to grab the blades of the dying grass and try lifting on it. Typically, grub damaged turf will fairly easily lift up exposing the grubs where they have been eating the roots off. I can treat for grubs, but timing is essential. Once the grubs near the end of the larval stage, they become very difficult to control. Applying treatment in mid summer before extensive damage is noticed is the best way of controlling the problem insects. Mole crickets are another serious turfgrass insect that can cause serious damage to lawns. Mole crickets feed at night during warm weather and after rain showers or irrigation. They come to the surface and feed on organic material, including grass, and other small organisms, including insects. During the day, and during periods of drought, they remain in their burrows, often for long periods of time. Mole crickets can damage turf by their extensive underground tunneling. Call me today and request your FREE estimate and lawn evaluation if you suspect that your valuable lawn has suffered from insect damage this year, or in previous years. Unless properly treated, turf-damaging insects usually come back again the following year causing even more damage.